Search for the best flight prices from Stansted to Perugia. Compare prices, book today and save money with Stansted Airport. 400 years of inspiring and unspoilt architecture hide away amidst the rolling hills of the Umbrian countryside in the medieval city of Perugia. Thanks to the thriving student population brought in by the two local universities, Perugia can boast a thriving arts scene and nightlife. Or if you prefer a more relaxing pace, explore the seriously delicious cuisine in one of the cities many restaurants, before souvenir shopping for the beautifully handmade local goods. This city's medieval architecture and the surrounding rolling hills of the Umbrian countryside have made Perugia a traveller must-do. With rooms set in a turreted castle, on a hilltop outside of town, Castello Di Monterone (Strada Montevile 3) is a decadent and unique treat. Right in the centre, Hotel Brufani Palace (Piazza Italia 12) offers bundles of timeless glamour and grace with its elegant old-world interiors. If you're looking for a peaceful, rural mid-range hotel, B&B Spring (Strada Delle Pulite 30) is a fantastic choice or, for those who want to be amid the action, B&B La Naiadi (Via Luigi Bonazzi 17) is a super-friendly, family-run place. Gorgeous Umbrian ceramic work should be high on your list for a special souvenir of your trip. Head straight to L'arte dei Vasai (Via Baglioni 32) to browse a wide range of beautifully made pottery that is difficult to resist. For quirky, original gift buying, don’t miss Olivoldea (Via Ulisse), which stocks all sorts of products made out of olive wood, or choose one of the traditional Umbrian fabrics on display at Il Telaio (Via Ulisse Rocchi 19). If you're in town for the fourth weekend of the month, the local antique market at Piazza Italia is worth a browse. 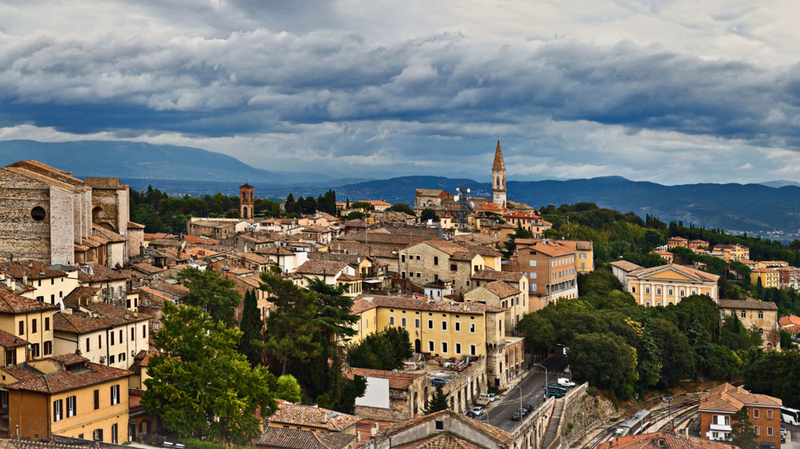 Perugia is all about solid Italian cooking, big on hearty plates of pasta and meaty main dishes. Don't miss Il Gufo (Via della Viola 18) for its daily menu based on the freshest seasonal ingredients and Restorante Naná (Corso Cavour 202) with its inventive takes on Italian classics. Those after some budget dining will adore busy and bustling Pizzeria Mediterranea (Piazza Piccinino 11-12), which serves up mounds of the country's favourite fast food throughout the day. Afterwards, pull up a bar stool at lively Enone (Corso Cavour 61) if you want to see where Perugia's people like to party. The city's patron saint is honoured annually with this religious procession which winds its way through the centre of town. There is plenty of dancing and street entertainment during the day and a dazzling firework display to top things off at the end of the night. Perugia's long and hot summer nights come alive with the sounds of jazz at this musical extravaganza. Internationally acclaimed musicians from across the world arrive in town to perform at this well-established event. The Trasimeno Music Festival hosts a programme of classical concerts and music workshops in Perugia as well as events in the Umbrian towns of Gubbio and Magione. A highlight on the city's cultural calendar, this classical music festival features a wide range of chamber music concerts, soloist performances and orchestra, held in historic venues across the Old Town. One for chocolate lovers everywhere, this festival celebrates the sweet stuff in all its glory and Perugia's reputation as a chocolate-making centre. There's a bundle of chocolate-related activities that are sure to have you shuddering at the thought of getting on your weighing scales afterwards.